For the NSScreencast iOS app I wanted to support downloading videos for offline use. With each video being between 80-200 MB in size, this requires some attention to create a download system that is resilient to failure. 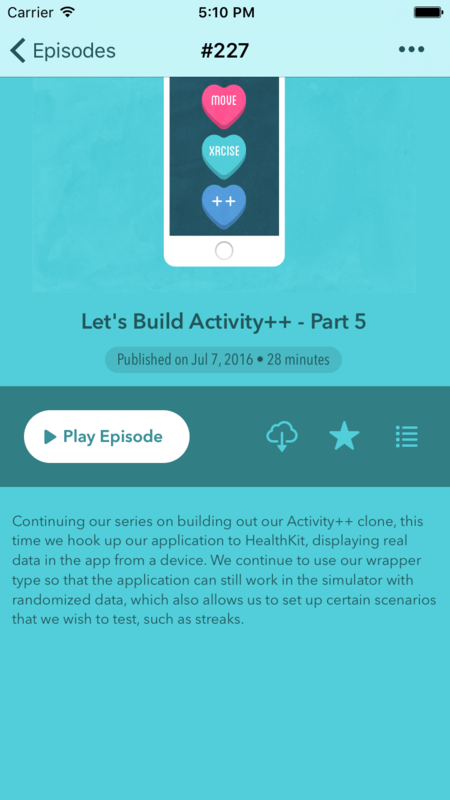 The first step was to add a download button that showed progress on the episode screen itself. This is done similar to how you download songs in iTunes. The download button animates into a circular progress indicator. The download happens in the background and sends notifications of progress that the button subscribes to to reflect the overall percentage in the UI. The actual download is done through an NSOperation subclass. Doing it this way offers a number of benefits such as controlling concurrency, quality of service, and having an easy mechanism for cancelling in-flight downloads. Download progress is sent out to the world via notifications that include the episode ID, so any interested piece of UI can intercept these and update. We of course don't need the user to stare at this screen while it downloads, so they are free to move around the app or even suspend it and the download will continue. Next, I needed a single place to show pending and past downloads to make it easy to see what's being downloaded, watch videos that have been downloaded while offline, and to delete episodes to free up space. This screen shows the data in a table view, with a row for each episode. Rows that are currently being downloaded need to get reloaded quickly, as progress notifications fly in. By leveraging Core Data for this, we can track the state of the download throughout its lifecycle. In the past I have used plists, but Core Data has become (dare I say) easier than plists for simple storage. You can see here that I do store the download progress percentage in the model, but I do not save this repeatedly. On fast connections, you'll get a flurry of these download progress changes (dozens per second) and it is not necessary to save to core data for each one. I only keep this data here in case we cancel the request and want to see this percentage in the UI when a download is no longer in progress. Another benefit of storing this data in Core Data is that we can take advantage of NSFetchedResultsController to quickly build up the DownloadsViewController. Any time a network is involved there is a chance for something to go wrong. This chance is exacerbated with large file downloads. People walk out of Wi-Fi coverage, enter tunnels, get on airplanes and plenty of other things that will interfere with the download. To ensure the best possible user experience, I wanted to handle this and allow users to quickly retry (and in some cases, have the retry happen automatically). When a failure happens, we mark the DownloadInfo's state property to .failed, and the UI can update accordingly. 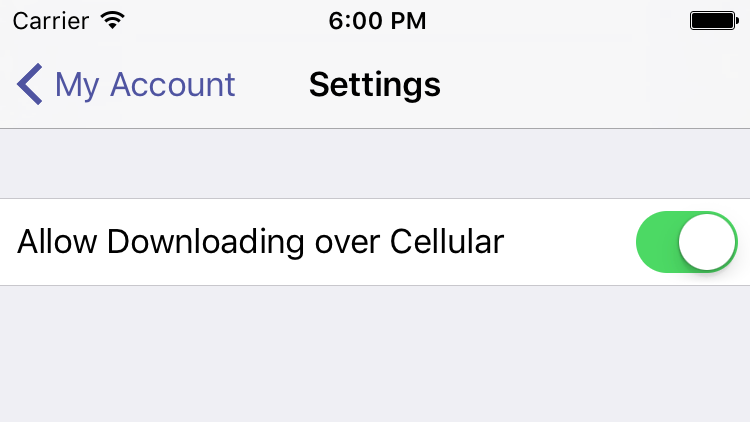 The cell gets reloaded and the user can tap to retry that download. When the NSURLSession API was introduced, they added the ability to cancel a request and produce an opaque object called resume data. Using this you can begin a request where it left off, the only question is how you want to persist this data so you can resume it later. This was a perfect fit to add to my DownloadInfo model. When the user taps a download in progress, I call downloadTask.cancel(byProducing:) and save the provided resume data to the model for later use. When a download is started, if the model has some resume data, it is used to resume the request at whatever byte offset they left off at. This feature was easy to add, but can be super useful for large file downloads. I didn't want to burn up anyone's data plan, so by default the NSURLSessionConfiguration has its allowsCellularAccess set to false. I then added a setting to toggle this flag, as some people have unlimited plans and might want to use it. Using FX Reachability I monitor the status of the connection. If the user tries to download an episode while we're on cellular I prompt them to toggle the setting and allow the download to continue anyway. Since I store metadata about files on disk, I need to make sure that these are always in sync. When you delete a downloaded episode, I have to delete the Core Data model as well as the file on disk. To make sure that these are always in sync, I have a CleanupDownloadsOperation that runs on app launch that checks that each saved DownloadInfo has a corresponding file on disk (else it gets deleted), and that each file in the downloads folder has a record in Core Data (else it gets removed). With this in place I have a fallback in case something goes wrong and the two states (db/disk) somehow get out of sync. While seemingly straightforward, background downloads represent a significant source of confusion and complexity, and will be the topic of my next post. When I first decided to add offline downloads to the app prior to shipping, I figured it would add a day or two of additional work, but it turned out to be surprisingly complex. Such is software, I suppose. 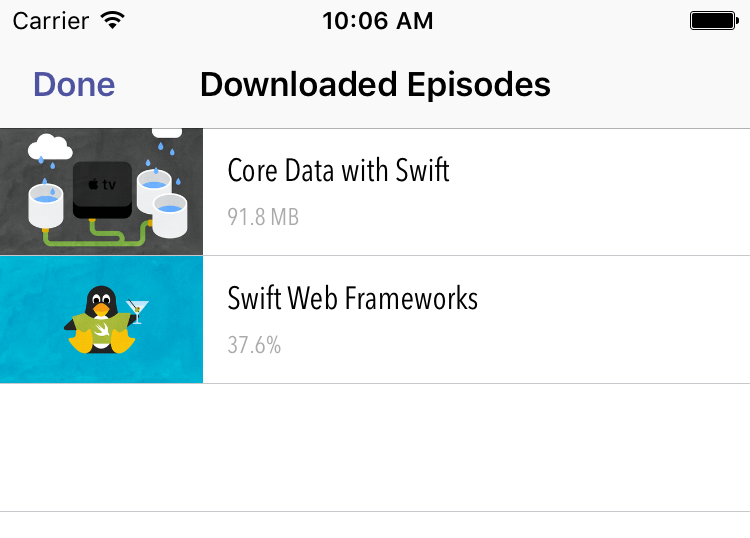 In the previous post I wrote about how I designed the download system for the NSScreencast iOS app. There's no need to have the user be forced to keep our app in the foreground while the download is in progress, we naturally want to support background downloads.